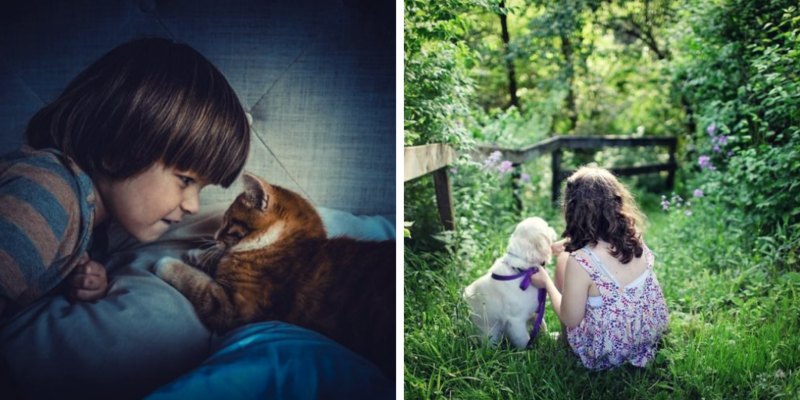 Getting a new pet is one of the most exciting times for a child. However, for a parent, there are different considerations to keep in mind. These include feeding it , caring for it, and ensuring it becomes a good fit with your family. As cute as a pet and a toddler are together, there are plenty of potential issues that could arise when you bring a new pet into your family. As a result, you need to be sure to introduce your pet to your children the right way. First and foremost, it’s very important that you supervise every interaction your child has with your new pet. No matter how nice and calm your pet may be, they are still animals and can be unpredictable at times. You also never know when your child might do something that could aggravate the animal, like pulling its tail. You should always be nearby and be ready to jump in if the interaction becomes unsafe for either your child or the pet. If possible, having two adults present (one for the child and one for the pet) is always a good idea. If you have more than one child, it’s a good idea to do introductions. The key here is to prevent aggression from either side, even if the two seem comfortable with each other. Children are the most common victim of dog bites, with many occurring when the pet and child are unsupervised. While your new dog or cat might look like a stuffed animal to your child, it’s important that you make the distinction that it’s not a toy. Your children need to know that it’s a living creature and should be treated with respect. In addition, you should be sure they know how to be gentle with the pet, especially if it’s smaller in size. Many children will be far too aggressive when petting a dog (such as squeezing, poking, or rubbing too hard), which can agitate the animal and could lead it to lash out. Be sure to get the animal used to your child before ever trying to get them to pet it. When introducing your new pet to your child, repetition is important. One technique that is often recommended is called the “Time Out” technique. This involves removing your dog and putting it in a different room for a few minutes every time it misbehaves around your child. When your dog stays calm and plays nice around your child, it should be rewarded. Eventually, your pet will behave around your child, as it’s been conditioned to believe that every time it does it will get a treat. As mentioned earlier, both pets and children can be unpredictable. While supervising is good, dogs and children can move quickly and you might not be able to react fast enough. Given this, it’s may be wise to have your dog on a leash during the first few meetings with your child. This will ensure you never lose control of the situation. After a few visits you can likely lose the leash, unless your dog exhibits bad behavior. Just like people have body language, so do pets. You need to be sure to educate your child on the different behaviors and body language that a pet exhibits. For example, bared teeth and a predatory pose could mean an aggressive or protective dog, while a tail tucked between the legs could mean the dog is scared. In order for the introduction to go well, your child needs to know when it’s okay to approach a dog and when it’s best to leave it alone. If they don’t know what a dog’s behavior or body language means, they may not understand what the animal is trying to show, and could end up getting scared or hurt.Ensure that your child’s demeanor is appropriate as well. Just as people have boundaries for personal space, animals have the same. It’s important to be aware of the right times to interact with an animal and when is best to leave it alone. For example, they should know not to disturb the pet when it’s eating, chewing on a bone, or sleeping. If your child doesn’t respect the personal space, the animal may potentially become agitated. The full introduction of your pet and child can be made easier if you involve your child in other activities. Formal introductions can feel a little forced, but doing things like taking the dog walking together can be more authentic. In addition to these activities, you should also have your child participate in pet care. Some examples include bathing, feeding, grooming, and giving it treats. This also provides the added benefits of teaching your child responsibility for your pet. While it would be lovely if your child and pet instantly become best friends (which does occasionally happen), it will often take time. Many pets will experience some form of anxiety when meeting someone new, so they may be temporarily cautious. It’s best not to rush it and move at a slow pace so everyone is comfortable. In conclusion, we hope that this post has been helpful when introducing a new pet to your children. It can be a process, but soon enough your pet and child should be getting along like the best of friends.